Maliki was speaking in a wide-ranging interview with Adel al-Tarifi, the newly named editor-in-chief of the leading Saudi daily Asharq Alawsat. The 3,800-word interview published today was conducted in Cairo on the sidelines of the just-concluded summit meeting of the Organization of Islamic Cooperation (OIC). Initially, I spent two years in Syria before moving [in1982] to the Ahvaz area in Iran. I went back to Syria in 1989 before returning to Iraq 16 years later. I have memories there [in Syria]. I have lots of love for it. I miss it. I crave to live there. I am choked with pain because the country could have been more stable and harmonious. Syria today is exposed to ruin and the total destruction of its institutions and homes. And frankly, no one sees anything at the end of the tunnel. Because I lived in Syria for many long years, I am familiar with the nature of Syria’s social structure. The longstanding sectarian strife between so-called “Alawites” and “Sunnites” – including mutual massacres -- is an open secret. The Alawites were able to regain power. That’s why the entrenchment is difficult to surmount. Accordingly, those who believed the regime would surrender and withdraw were in the wrong. In reality, the Alawites were given “the courage of despair.” That’s why their men and women are fighting with their teeth for their survival. None of that is new to me. I saw it as clear as day. I said it in Washington to [Barack] Obama, [Joe] Biden] and [Hillary] Clinton. The problem has now turned into a proxy war, not a Syrian civil war. It has grown into a proxy regional war, with Russia and America also involved in both battle and dialogue. It seems they have lately agreed on a solution to the crisis. All our feelings and emotions are supportive of the Syrian people and their quest for democracy, freedoms, including the freedoms of expression and association. The [pre-uprising] atmosphere was unacceptable. But to express [grievances] that way led the country to ruin. No one knows how Syria can be rebuilt. However, we hope the crisis ends in a way allowing Syrians to realize their demands, Syria to recover its stability and the killings to stop. Without its cessation, violence will increase and so will the arming of both sides, leading them to believe they can settle the issue [by force]. That could be true elsewhere. But in Syria, the force of arms won’t settle the battle. The regime does not want an exit pass. Impossible! The regime is not looking for a way out. It is not free to accept or refuse because its internal circumstances dictate it should stay put and fight to the finish. The gamble was on outside forces intervening, as happened in Iraq. But it seems the Iraq template cannot be duplicated in Syria or in other places because it is too burdensome. Thus, the regime’s insistence on its options can be traced back to its accurate reading of the international map. It knew that what happened in Iraq is impermissible for Syria, which explains the repeated Russian and Chinese vetoes [at the UN Security Council]. [Regime] Syrians on the other hand have political insight. Their political map reading was correct. They dumped their problem in Russia’s lap. We in Iraq took a neutral stand on the issue because Syrian unrest affects our country first and foremost. We were worried al-Qaeda would seize a new opportunity in Syria. In effect, Jabhat al-Nusra and other offshoots of al-Qaeda found themselves in Syria. This affects us directly in Iraq. 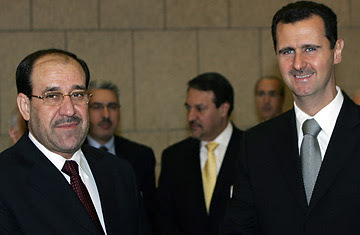 After we thrashed al-Qaeda in Iraq, we now dread its return through the Syrian door under a new [Syrian] regime. That’s why we chose to remain neutral, saying we are neither with the regime nor with the opposition. We visualized a solution, which we shared with Kofi Annan then Lakhdar Brahimi, with some delegations to the Arab summit [in Baghdad]. Our perceived solution is where dialogue reached today. There is no choice other than a peaceful settlement. It seems to me an agreement on one is looming on the horizon. That’s what Syrian National Coalition leader Moaz al-Khatib talked about, despite the brouhaha his proposal created in Coalition ranks. I don’t think Khatib made his [talks] offer without sensing an international decision to go that route, whereby sequentially: a new government is formed, Bashar al-Assad stays, elections are held, a consensual government of national unity is set up, Assad would not run for another term. That’s the only peaceful solution on the table. Calls for Assad’s exit are vehemently disapproved by Russia. He refuses and Russia objects. But would he [Assad] stay during the peaceful solution and then run [for re-election]? It seems the solution provides for him to stay but not run [for another term]. He would stay in the shadow of a new government comprising opposition and regime figures. It would also be balanced so as to get things done. National elections under international supervision would be next. These would yield a constituent national assembly to either draft a new constitution or revise the existing one. A government would then be set up in keeping with the weight of representation in Parliament.